We have chosen this recipe from among the many version that exist, as it follows some of the basic principles fundamental to the preparation of Bagna Càuda. The three basic rules are: never boil the oil; never burn the garlic, nor allow it to darken; like a true gourmet, only eat a moderate amount. Following these rules overcomes the problems of “garlic breath” and of digestion difficulties. Break the garlic into cloves and peel it. If it isn't fresh, remove the internal germ. Place the garlic in a saucepan and cover it with milk, and simmer until tender to the point of a knife. Discard the milk, and chop the garlic coarsely with the point of the same knife. Return the garlic to the saucepan and add the oil. Rinse the salt off the anchovies and wash them in vinegar. Pat them dry and add them to the oil and garlic. Return the pan to a low heat (the oil mustn’t boil) and stir continuously (in order not to burn the garlic) until the mixture reaches an even consistency. (Clearly, this operation was much easier in the past, when it was done over the live coals of a brazier, rather than on a stove or with a gas cooker). After about 20 minutes add a little butter, stir the mixture until the butter melts, and serve in the special warmer. Be careful to keep the dip warm without letting it boil. According to tradition, bagna càuda was eaten by dipping only cardoons and raw capsicums, and good bread, but it seems right that the evolution of the dish now allow the inclusion of: Jerusalem artichoke in slices or strips, cabbage leaves, boiled turnip, baked beetroot, and baked capsicums. 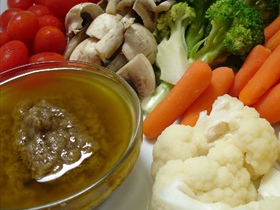 The vegetables are served with the dip, precut into pieces, and arranged in a large serving dish. Wine Suggested: The typical wines with Bagna Cauda are a href="http://www.cathayway.it/vintage-wines/catalog.php?q=barbera">Barbera and Dolcetto. We go for Dolcetto, it's a lovely fresh wine that goes well with fresh vegetables. No need to have strong wines, leave the oak to other dishes. Go with the dolcetto di Dogliani and come back.